I loves me a maxi dress, and this one is no exception!! It's another self-drafted number, but is loosely based on Simplicity 8014. I absolutely love this lime green fabric. It's a linen/cotton mix that was an ebay purchase from last November, bought during "The Great Dress Fabric Buying Haul" when I should have been looking for fabric for my green coat! It was from Fashion Fabrics 4 All on ebay, was £8.99 per metre, and I bought 3 metres. Button size turned out to be an issue too. It took three goes to find the perfect buttons - these ones are from The Button Company. The second lot were from Textile Garden, and are gorgeous, but are also 5/8" wide. As hard as I tried, I couldn't get them to work with a horizontal buttonhole along with the top stitching. 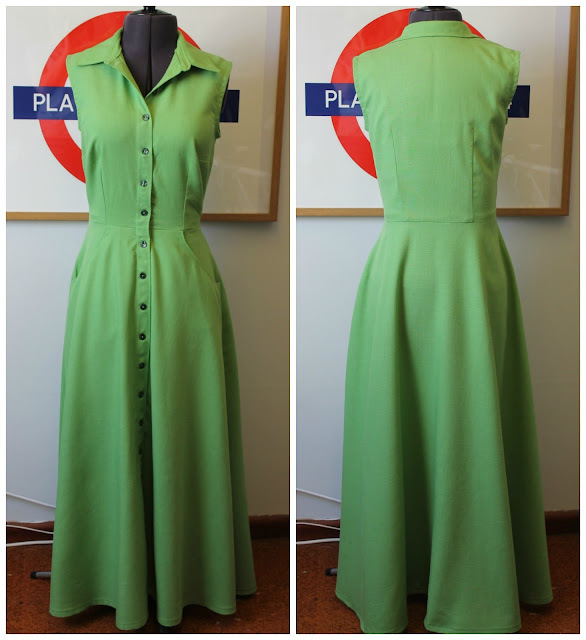 And just be very glad that you don't live in my house when that was happening, but I think I've got top stitching a shirtdress out of my system now! 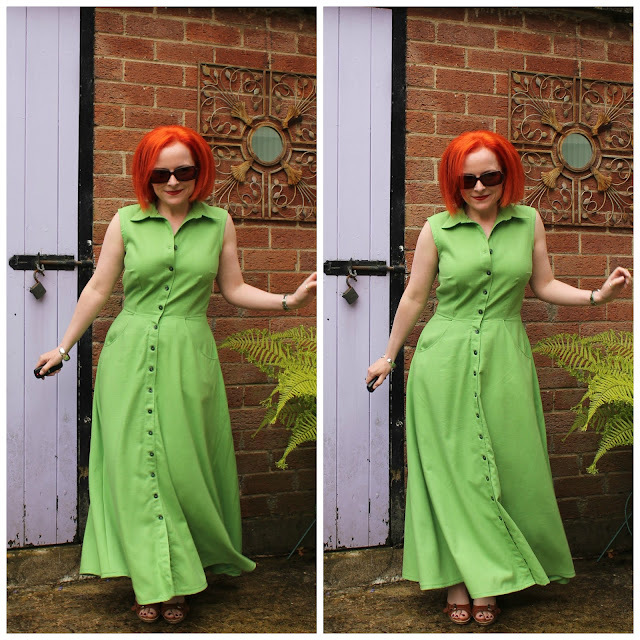 As I'm still very much enamoured with the pockets on my Hemingway Fabric Dress, so used them again on this. The skirt is my half circle skirt. I had to narrow the side seams a bit to fit in on the fabric, but it all worked out. I blooming love this dress, it good and swishy, as a maxi dress should be. My sister said it was very 1950s/Grace Kelly, but also very 1970s/Jerry Hall. And this is why my sister is one of the best people on the planet! As I was taking my photos, Valentine decided he wanted in on the act (although he does look slightly bewildered). He felt that it was important to show how my hair now matches him. I got my hair done last week, and I blooming love it too! I finally found a hairdresser who isn't afraid of bleach or orange. If you're in Belfast, it's a salon called Twisted Scissors and Soul on Rosetta Road. Fabulous, I love the idea of a maxi shirt dress and the colour is superb! Thanks Ruth! Isn't the colour fabulous?! That is definitely a very swishy skirt! Love the kitty photobomb too! Thanks Helen! Valentine's such a show off!! Thanks Colette! I love this fabric, and also how it goes with my hair! Colour of your dress and hair are a perfect combination for "our local" season!!! Stunning dress Lynne. Loving those pockets. Thanks Ruth! Love United Nations via sewing!! And am also still loving these pockets. Great dress Lynne! The maxi length in a solid colour is quite dramatic, and the lime green looks great with your new hair! Thanks Ruth! This colour is fabulous, and I love how it goes with my hair. Thanks Kathleen! I think your right about the linen content, and I washed it three times before cutting out in case it shrank! This is stunning! The colour of the green fabric goes brilliantly with your hair!